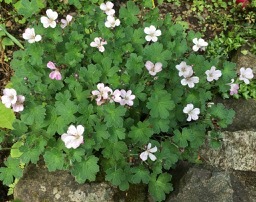 This pretty little hardy geranium was introduced to the Conservation Scheme in 2015 with plants propagated by the Isle of Wight Group from a plant obtained from Elworthy Garden Plants in Somerset. The cultivar name was registered by Elworthy Garden Plants in 1998 in the Register of Geranium Cultivar names and published in their nursery catalogue. 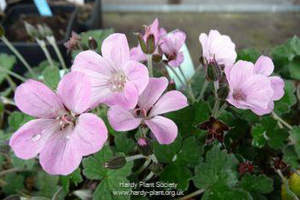 It was discovered as a chance seedling found in a paving crack by Juliet Robinson, a past secretary of the HPS Hardy Geranium Group, and described as having bushy mounds of soft grey-green leaves to 10-15cm covered from May onwards with abundant shell-pink flowers. The flowers have 5 petals that have a lovely sheen. The plant is a sterile hybrid, producing no seed, which results in a prolonged flowering period through the summer to at least September when flowering is halted by a drop in temperature. With abundant, open flowers it is attractive to bees and other pollinating insects. It requires a sunny position in well-drained soil at the front of a border and does not thrive if overwhelmed by neighbouring plants. There have been no reports of problems with pests or diseases and it is tolerant of a range of soil types as long as the drainage is good. The parentage of this plant is uncertain, but suggested to be a cross between G. antipodeum (itself a hybrid between G. traversii and G. sessiliflorum) and G. x oxonianum. Several groups are now growing this plant in various situations across England and it seems to be reliably hardy and well-liked. Divisions can be rooted easily in spring under cover and grow rapidly to flowering size although some reports suggest plants have taken a season to settle after planting into the garden before starting to flower. Listed by only 4 nurseries in the RHS Plant Finder, this is an increase from the 2 listed sources in 2015 and although there are a number of smaller hardy geraniums available there is no denying that this is a very attractive plant. 0 Comments To "July's Conservation Feature"